The end of the year is often characterised by celebration - by eating, drinking, giving gifts, and traveling to see friends and family. While I'd never want to diminish the importance of spending time with family, this time of year is also notorious for excess and waste. I've already dug a bit into consumerism and waste this year, but as we approach the period of gingerbread houses and eggnog, food is front and centre. Not so surprisingly, in the United Kingdom for example, an estimated 4.2 million Christmas dinners went to waste in 2014. In industrialized nations, this waste occurs at roughly three points: 1) at the farmgate, where retailers determine if produce meet their aesthetic standards; 2) at the shops, where retailers ensure shelves are always amply stocked; and 3) in the home, where we either cook too much or fail to prepare foods in time. And while some of these things seem out of our control, it is important to recognize that we don't just waste food during holiday times; we can actually be proactive about this waste year-round. We're in a bit of a predicament about waste reduction ambitions for points 1 and 2. Australia has a highly concentrated food retail market - Coles and Woolworths make up an astounding ~70% of the market, though only 45-50% for fresh produce (which, alongside bakery, are the biggest retail wasters). A Conversation piece from earlier in the year essentially argued that curbing waste on this end of the food chain comes down to policy and regulation, drawing on the example of retail food waste bans in France. The vast market power these businesses enjoy allows them almost free reign in dictating the quantity and quality standards that farmers must meet. Organizations like OzHarvest help on the other end, by collecting and redistributing food surplus to charitable organizations. But there is a big sea, and there are both legal and logistical issues to overcome to fully address the approximately 44 million tonnes of waste. Australian retailers are still lagging in discounting products close to their sell-by dates to move them from the shelves to people's plates (and not the bins), and there are other low-hanging fruit. But there are also the choices we as consumers make that affect food waste, and ultimately would have trickle-down effects in terms of the Big Guys' sourcing practices and policies. A Rabobank study found that Australian households toss 14% of their weekly groceries. The Foodprint Melbourne Project found that the amount of food thrown away in the city in one year could feed two million additional people over that same amount of time. For my environmentally-inclined readers, this also amounts to 3.6 million hectares of land, 2.5 million tonnes of greenhouse gases, and 180 million litres of water. Decreasing these numbers and making more conscientious decisions about what we buy, can provide a signal to retailers from the demand side for how they should act. You're makin' a list, and checkin' it twice, buying too much is not very nice! How to tell, does it smell, the date says it should go. But oftentimes, the food is fine, use your senses and you'll know. I'm dreaming of a leftovers sandwich, one from the meal the eve before. The platefuls of food are frightful, but spring will be so delightful; dump scraps in the compost so, things can grow, things can grow, things can grow. Well, that's all I've got. Stay tuned for some quick Chanukah musings on oil and a recap of the action-packed year. 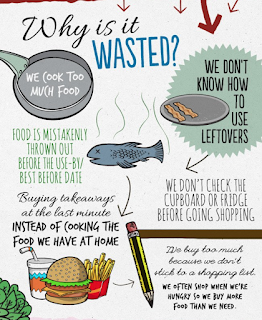 Here's to a foodwaste-free holiday!